MILLER FOUR THOUSAND years after a man wrote a love letter, a bookkeeper, a chemist, and a scholar got together and deciphered the missive of adoration. Sounds crazy, doesn’t it? But that’s exactly what happened. The story goes like this. Ever since scientists began digging up the contents of Babylonian wastebaskets, they have been trying to work out some simple system for preserving and deciphering this ultrapersonal correspondence. Of course, the secret of cuneiform writing on clay tablets, with its odd-looking, wedgelike marks, was discovered years ago, but that was just the beginning of trouble for the archaeologists. In the first place, the clay tablets were likely to be ruined be- fore they could be read, and in the second place, it took so long to decipher even one tablet that it looked as though our civilization would be dead, and forgotten too, before that Babylonian correspondence was figured out. Babylonians did their “nail” writing by jabbing the triangular point of a stylus into small pieces of wet clay. Sometimes, when the letters were of particular importance, they baked the tablets, but usually they merely dried them in the sun. After these tablets had been in the ground for a few thousand years, they began to get soft and squishy. When they were dug out, they were in danger of being mashed before the scholars could decipher them. Even when they were dried successfully, they were often covered over with mineral salts. Then somebody thought of calling in a chemist. The chemist experimented with homemade tablets, and then came to the conclusion that it was possible to finish the Babylonians’ job for them. In other words, he devised a method whereby the tablets could be removed from the excavation, dried in the sun, specially packed, and finally baked in a modern electric furnace. Next, the chemist fiddled with acids, and finally found that certain acids would remove the incrustation of salt without injuring the tablets. But there still remained the problem of the slowness of translation. Now one of the biggest difficulties in this work was the fact that the Babylonians used so many signs that no normal scholar could carry them all in his mind. 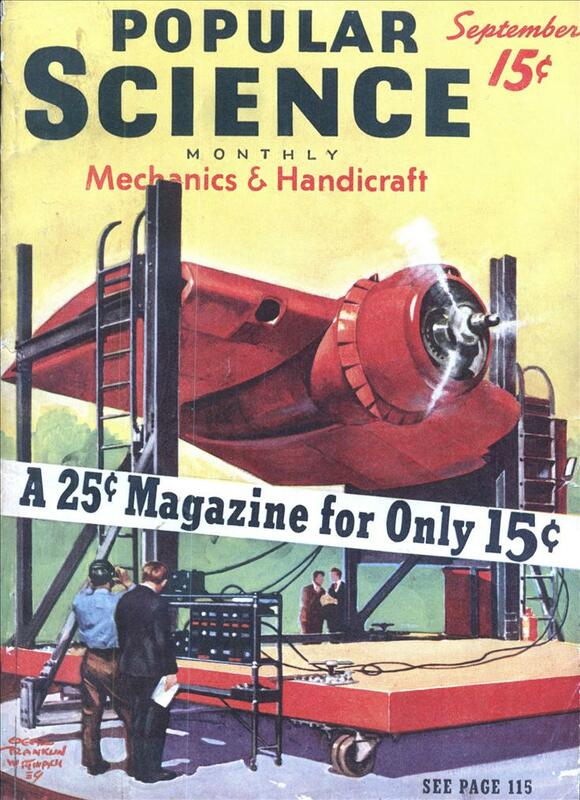 That meant endless time spent thumbing through the pages of reference books. Recently, when he was getting tired of looking up Babylonian signs, Dr. Carl S. Knopf, of the University of Southern California, had an idea. He suddenly realized that the problem wasn’t one of archaeology, but of business efficiency. So he consulted a bookkeeper, and together they worked out a visual index system by which the meaning of any sign could be found almost instantly. Thus a combination of chemistry, bookkeeping, and scholarship has recently opened the door to the personal lives of people whose civilization lies deep beneath the desert sands. 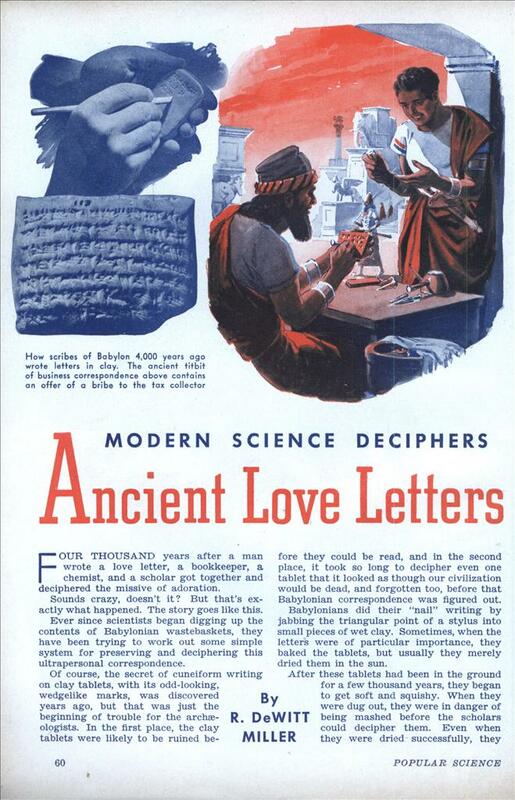 But if Gimil’s love letter gives the impression of having been written today, many Babylonian commercial documents embody an anti-forgery technique which surpasses anything that modern civilization has ever been able to devise. After a Babylonian document was written on clay and signed by the witnesses, it was covered with a clay envelope. Then the document was written a second time on the outside of the envelope. This also was signed and witnessed. As it was—and still is—impossible to fit a new clay envelope on a tablet after it is dry, these documents were forgeryproof. If there were any question of the outer inscription having been tampered with, it was only necessary to break open the envelope and examine the inner tablet. These tiny cylinders of stone or shell, about an inch high, were carved with scenes from daily life. Each person had his own scene. To sign a document, it was only necessary to roll the cylinder over the wet clay, thereby impressing the scene. As the figures were cut in reverse, this custom probably represents the world’s first attempt at printing. It took 4,000 years and the help of modern science to bring that bit of graft to light. 4,000 years and a document can be read. I doubt most of the digitized documents of today will last more than 100 years. That’s if the equipment is still around to read it. We should go back to clay. Even where digital copies survive, there’s no guarantee that a document can be interpreted. Once a program is no longer used, there is no incentive to produce code that can decipher the documents it saved. Where now are Edword, First Word Plus, and Protext? If someone sent me a document in one of those formats, I’d probably have to dissect it in a binary editor and write a filter by hand if I wanted to get back the original in all its glory. Stephen » I think it’s the actual physical media that’s the problem. If we have a binary archive of the data it should be ok. Not that it’s simple, but most formats that aren’t heavily encrypted can be decoded if you work at it. And once someone in the archival community has done it, then the same code will work for everyone. Actually, I don’t know if there is such a project already, but some sort of archive of binary file format converters all written in a common language would be pretty neat. There’s not only the problem of reading digital documents, the real question is do we have any digital storage medium that will last 4,000 years? Who knows, we haven’t have digital storage medium for 4,000 years.